In this post, I will examine sovereignty, which is the full right and power to govern without interference from an outside source. It is worth a look because turmoil is certain when society questions, or isn’t sure of, just who is the sovereign. Between 1765 and 1789, thirteen societies huddled against the North Atlantic Ocean endured revolution and continual economic discord due in part to puzzlement over the question, “Where the sovereign?” The social upheaval associated with revolution in government in this period cannot be overstated. In twenty-four short years, republican free government replaced a top-down monarchal system of influence and patronage. As John Jay wrote, “It takes time to make sovereigns of subjects.” It also took time to establish political institutions for the purpose of expressing the sovereign will. Who, or what institution, was supposed to be in charge? Where was political authority? We can better understand the shift in mindset from royal subjects to republican citizens if we examine some events from this not very well understood time. From my desktop America Heritage Dictionary, a congress is defined as a coming together, a meeting. The first American congresses began not long after our victory in the French and Indian War. To offset some of the enormous expenses, Britain attempted to raise revenue in her colonies through new taxes. In response, representatives from various colonial councils and committees of safety met in congresses, extra-legal gatherings of equals to discuss and debate appropriate actions. Congresses. No royal governor sanctioned, and several prevented, sending men from colonial legislatures to the Stamp Act Congress in 1765. Without debate, both the House of Lords and Commons dismissed its petitions and declaration of rights. Perhaps the hardest hitting declaration was, “That his majesty’s liege subjects in these colonies are entitled to all the inherent rights and privileges of his natural born subjects within the kingdom of Great Britain.” That meant the 1689 English Bill of Rights. Without royal sanction, wasn’t the Stamp Act Congress at least extra-legal? Was it justified under the Laws of Nature? Wasn’t the British government sovereign and entitled to enact statutes to govern its colonies? Upon repeal of the Stamp Act, Parliament expressed its sovereignty in no uncertain terms through the Declaratory Act. In response to Parliament’s Coercive Acts, the First Continental Congress met in the autumn of 1774. It advised colonial committees of safety to enforce a boycott of English imports and to set retail prices. Wasn’t the advice of the Continental Congress illegal and treasonous? On the other hand, the Coercive Acts, in response to the Boston Tea Party, closed the port of Boston, revoked Massachusetts’ Charter, and established martial law. Was the advice of the First Continental Congress in accordance with the Laws of Nature? Was the British government still sovereign? If so, weren’t the Coercive Acts legal and binding on the colonies? From what statutory legal source did the Second Continental Congress exercise authority over any state and conduct the Revolutionary War? From May 1775 to ratification of the thirteenth state to the Articles of Confederation on March 1st 1781, the Continental Congress attempted to man and supply armies against Great Britain and treat with foreign nations. Was the Continental Congress sovereign? Considering George III cast his thirteen colonies outside of his protection, declared war upon them, and threw them into a State of Nature in December of 1775, weren’t the defensive actions of the Second Continental Congress against the king entirely proper and just under the Laws of Nature?1 Still, who was sovereign in America? What about the British King’s sovereignty over his colonies? I ask Article V opponents to explain the legality of the establishment of the Articles of Confederation on March 1st 1781, when George III didn’t renounce his sovereignty until the 1783 Treaty of Paris. When independence became a fact, sovereignty of the people was understood to be the people organized as states and not the people organized in a nation known as the United States.3 Despite the de jure pledge of each state to abide by congressional resolutions, each state continued to serve as the ultimate, de facto governing expression of the sovereign people. In the mid-1780s, loyalty to country meant loyalty to one’s state and not the loosely confederated United States. As such, and as we’ll see in the next blog post, state legislatures, as the expression of the people’s sovereignty, often defied congressional resolutions. Per the Declaration of Independence, government exists to secure our unalienable rights; the AC proved inadequate to the tasks (Article III) of common defense, security of liberty, and general welfare. Despite words on paper the AC congress never was and never could be the governing expression of the sovereign people. Conclusion. As our experience showed, turmoil is certain when the institutions of governing authority are uncertain. As a descriptor of the times, the mid-1780s were indeed tumultuous. The AC were never the embodiment of sovereignty at all; they were never the supreme law of the land and as such, could not limit the just acts of the sovereign people as exercised through their states, including the decision to send delegates to a convention in Philadelphia. While Article V opponents will continue to impugn the governing form they refuse to amend, we Article V proponents can rest easy knowing the Constitution was, through the states, the legitimate and just expression of the sovereign people. Burnett, E. C. (1941). The Continental Congress: A Definitive History of the Continental Congress from its Inception in 1774 to March, 1789. New York: W.W. Norton Company. 138. Jensen, M. (1940). 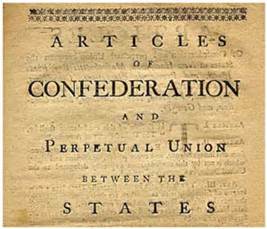 The Articles of Confederation. Madison: The University of Madison Press. 161.